For those struggling to do life, who pray badly yet long to connect to with their heavenly Father. This new edition includes an expanded chapter on using the practical "prayer cards" a hallmark of the teaching found in A Praying Life and a chapter on the need and use of prayers of lament. Prayer is so hard that unless circumstances demand it most of us simply do not pray. We prize accomplishments and productivity over time in prayer. Even Christians experience this prayerlessness-a kind of practical unbelief that leaves us marked by fear, anxiety, joylessness, and spiritual lethargy. Prayer is all about relationship. Based on the popular seminar by the same name, A Praying Life has discipled thousands of Christians to a vibrant prayer life full of joy and power. When Jesus describes the intimacy He seeks with us, He talks about joining us for dinner (Revelation 3:20). A Praying Life feels like having dinner with good friends. It is the way we experience and connect to God. 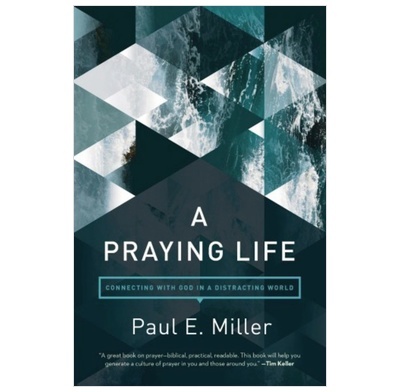 Paul Miller lays out a pattern for living in relationship with God and includes helpful habits and approaches to prayer that enable us to return to a childlike faith. Outstanding. Or at least the earlier edition was. So I assume this newer expanded one is even better. It is breath-takingly real and very warm-hearted, and thoroughly Biblical. Highly recommended.